This original version of the Electra Page is maintained for archival reference. Welcome to The Electra Guitar Page! 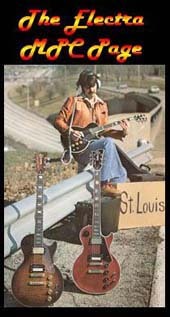 This page is a guide to the Electra brand guitars sold throughout the 70's and 80's by Saint Louis Music (SLM).At first copies of popular brand guitars, Electra added features that were hitherto unavailable in mass-produced guitars, and developed a series of original designs as well. The MPC models featured onboard electronic modules that added effects such as distortion and phase shift that could be controlled via the guitar's controls. The high quality and innovation of these guitars has made them beloved by players of all styles, and their economical prices remain attractive even today. Please DO NOT link to this page or pictures from your eBay ads! which has no affiliation or responsibility for this site. We thank SLM for bringing us some of the world's best guitars.